Mr. Robot's finale was totally setting up for the already ordered second season, but there was probably a moment you missed that will blow your mind. Yes, the first season of Mr. Robot technically ended with Elliot (Rami Malek) alone in his apartment after sort of coming to terms with the fact he'll keep seeing his dead dad (Christian Slater), little self and mom, then he received a knock on his door. He got up and opened it. Boom. Credits rolled. But! After the credits, USA snuck in a little single-shot scene featuring Michael Cristofer's E Corp CEO Philip Price in an opulent mansion having a conversation with… the Whiterose?! Yes, that is B.D. Wong. Yes, when we first met Wong's character she was a woman. So…huh? Wong said creator Sam Esmail explained it to him that Whiterose is transgender, but "her transness has nothing to do with anything." "Sam then told me the irony really is that Whiterose is in disguise when Whiterose is a man, and not when Whiterose is a woman. At the end of Wednesday night's episode, when Whiterose meets with [Evil Corp CEO] Philip Price, Whiterose may or may not be suppressing all of the femaleness of her to have these conversations with Price. That is a very radical concept, which I don't know if we have ever seen before," Wong told Vulture. "I made it clear to Sam that I am not comfortable with the idea of masquerading. He said, 'If there is any masquerading at all, it is Whiterose masquerading as the businessman working with Philip Price, not the reverse.' That, to me, was interesting. I don't yet know what he means by that, and I hope the show goes a bit further with it." So Wong is just as in the dark as we are. Good to know. As for the scene and why it was at the end of the credits, Esmail said he felt weird ending on somebody other than Elliot, so USA let him get that in after the credits. "I always knew I wanted to end the first season like that. I didn't want the audience to come away thinking FSociety had won because they took down the bad guys. Evil Corp is done, so the stakes are gone. But I always knew there was another layer," he told Vulture. "We're not even half-peeling this whole thing off yet, and we are going to show you a little bit of it. I always had that scene in my head as the last scene of the season, because I wanted to tell the audience the stakes are going to go even higher." Mr. Robot returns for a second season on USA ext year. 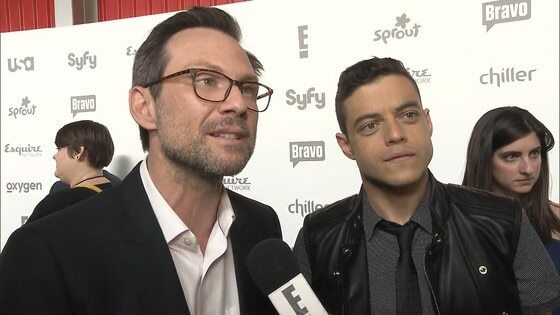 Christian Slater Makes Big Return to TV in "Mr. Robot"
CLICK: 2015 Fall TV spoiler-rama!